For the second time judges unhappy with judicial reform, they gathered in front of the Courthouse in Sofia. This time their number was impressive, there were judges from the SCC, SAC, SAS, Sofia City Court, Administrative Court Sofia-city, SRS and courts outside the capital. Magistrates were badges with the logo of Themis lapel, and some came back in togas. Among the judges was the chairman of the SCC Kaloyan Topalov both until recently deputy ministers of Justice and Petko Petkov Verginiya Micheva. Many citizens and lawyers came to 17.30. Before the Court to support the judges. They chanted "Reform" and applauded the magistrates. Unlike the first meeting, today there were people who questioned the judges for reform. Part of inquiring showed interest in the topic of allocation of allowances in both colleges and caused tension on this issue. "People need to explain why this is so important. The standard is the judges elected by their fellow judges to be a majority in the personnel authority. It should be clear that the presidents of the Supreme Court of Cassation and the Supreme Administrative Court are not selected by the judges . They are elected by the Supreme Judicial Council and in this sense it can be said that under the current allocation in officiating staff, judges elected by judges are the majority, "said Judge Yana Dimitrova District Court Razlog. She reminded that speak for faster justice, but clarified that it is now possible. But it is important what people administer justice, and this depends on the SJC because it is the body that appoints judges. President of the Union of Judges Atanas Atanasov, in turn, was surprised by the support they receive judges. "Our mission is purely Enlightenment. After hundreds of declarations which are sent to the media, this time we wanted to go with their faces to the people to ask for their assistance to reform the judiciary," said Atanasov. His colleague added that are not on the street to topple governments or say any justice minister, and to declare that to have a well-functioning justice system, there should be a well constituted Supreme Judicial Council, which carried out necessary staffing choices and career development. It expected on Wednesday from 16 hours in the courthouse to be held open day. Magistrates from various metropolitan courts will explain to people why it is important to have an independent court. While in Plovdiv even before the courthouse in the city gathered in silent protest of about 50 lawyers. According to them, due process can provide only independent judges and a controlled and responsible prosecution, BNR announced. 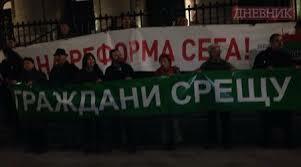 Only one judge - Krasimir Lesinski RS-Pazardzhik joined a silent protest in front of Plovdiv courthouse. From my perspective, things are so that one party in criminal proceedings, such as the prosecution should not have a casting vote in the personnel policy of the court, said the judge Lesinski, cited by BNR.